There are four sets of links/icons that help a user to navigate the ZMC pages and are present on most pages of the 'ZMC'. (ii) Admin /Log out links and Change Backup Set Drop down box. (iii) Shopping Cart etc icons. (iv) Alert Box / Event Log page icons. These two links are present on every page of ZMC in the left hand corner. The About link leads users to a short description of ZMC, its version details and its licensing terms. The User Guide link leads to this manual. These three items are present on all pages after a Backup Set has been selected. If no Backup Set has been selected, 'Change Backup Set' drop down box is not visible. The 'admin' link is hyper linked to the Admin page of the software. The Admin page provides a convenient way to Add/Edit Users/ Backup sets. The Change Backup Set is a drop down box that lists all the Backup sets that a user has named and which a user can select. 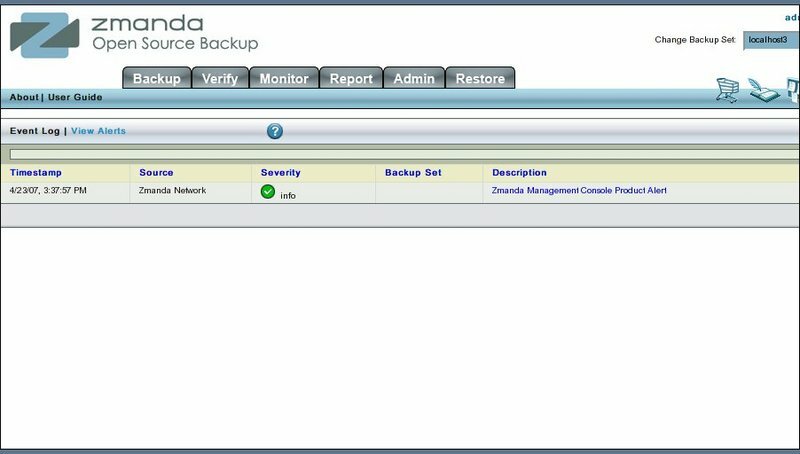 The drop down box shows all Backup Sets that have valid names. It does not differentiate between sets started, completed the configuration, and activated. The 'Log Out' icon provides the way to log out of ZMC. All functional pages have three Alert Box icons on the middle right hand side of the Alert Bar. The question mark icon just ahead of the Alert Box and Event Box icons is hyper linked to the Table of Content of User Guide page. Note that the icon has now changed its shape --clicking on this icon closes the Alert Box. The third icon opens a new page (Event Logs page) where Event logs can be seen in full. These five icons are present on all pages of ZMC in the middle right hand side. Shopping Cart Icon, the first icon from the left, allows users to purchase Amanda enterprise subscriptions. Writing Book Icon, the second icon from left, allows users to look up information on Zmanda community wiki. Bulletin Board Icon, the icon in the middle, hyper links to Zmanda forums. Bulb icon with Z, the fourth icon, takes users to the Zmanda network login page. Home Icon leads users to the home page of Zmanda Inc.